In the background: The Naval Square Development, which borders and dwarfs the Devil's Pocket (unseen in this image). Devil's Pocket is a small neighborhood in the South Philadelphia section of Philadelphia, Pennsylvania. 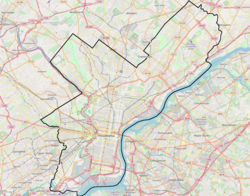 The neighborhood, bordered by Christian and Taney streets, Grays Ferry Avenue, and the Naval Square development (the former U.S. Naval Asylum). The neighborhood consists of rowhouses tucked near an industrial landscape near the Schuylkill River. A historically Irish-American neighborhood, Devil’s Pocket has seen real estate development and gentrification in recent years, including a major expansion of the Children’s Hospital of Philadelphia. According to one legend, Devil's Pocket got its name after a priest said the local youth were rough enough to steal from the devil’s pocket. The 1983 novel God's Pocket by Pete Dexter and its later 2014 film adaptation are set in the fictional South Philadelphia neighborhood of God's Pocket, which is based on the tough reputation of Devil's Pocket. ^ a b c d Shelly, Kevin C. (2015-08-27). "Devil's Pocket neighborhood fading away". PhillyVoice. Retrieved 2018-07-26. ^ U.S. Immigration Commission (1910-01-31). Immigrants in cities: A study of the population of selected districts in New York, Chicago, Philadelphia, Boston, Cleveland, Buffalo, and Milwaukee (Report). pp. 352–3. ^ Saffron, Inga (2012-07-06). "CHOP expansion could bring jobs, traffic". Philadelphia Inquirer. Retrieved 2018-07-26. ^ Klein, Michael (2014-10-21). "A bar for Devil's Pocket". Philadelphia Inquirer. Retrieved 2018-07-26. This Philadelphia County, Pennsylvania state location article is a stub. You can help Wikipedia by expanding it. This page was last edited on 22 April 2019, at 23:48 (UTC).